It’s that time of the year again. Arena crews are painting logo’s and starting to lay down ice and training camps around the league are starting to open. In fact, the Colorado Avalanche rookies reported to camp yesterday, but will not be on the ice until tomorrow. Veterans report to camp Friday the 17th for physicals. Training camp is a very important time of year for everyone on the team. Veterans need to get back into game shape, and rookies are fighting for a spot on the team. With that being said, I thought I would take a look at some of the rookies who have a shot of making the Avalanche roster out of camp much like Matt Duchene and Ryan O’Reilly did last season. I believe Colorado is over the cap floor since they still have Tom Priessing’s buyout on their salary, but if not management may look to sign a rookie defenseman to travel with the team and get them over the cap floor. In my opinion there are three players who have a shot of making it, Kevin Shattenkirk, Colby Cohen, and Stefan Elliot. 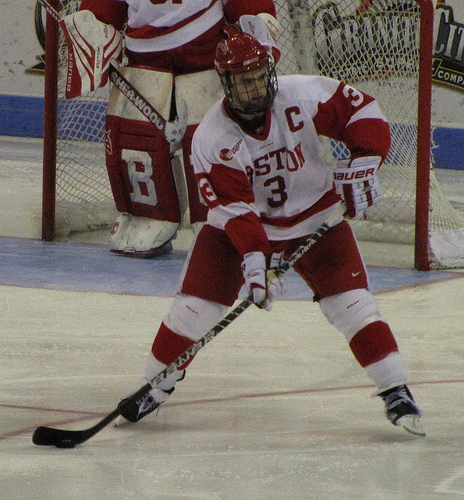 Kevin Shattenkirk played for the Boston University Terriers last season and won the NCAA National Championship. Shattenkirk has a rocket from the point in the offensive zone which is something Colorado could use on the power play. He also see’s the ice really well and reads and reacts to plays exceptionally well. Shattenkirk played 3 games in Lake Erie last year and recorded two assists. He is, however, only a senior so he would have to forgo his last year of his college career. Fellow senior BU teammate, Colby Cohen, also has a shot of making this team out of camp. Cohen netted 14 goals and 16 assists in 36 games last season with the Terriers. He also recorded 1 assist through 3 games with Lake Erie of the AHL. Cohen reads the play extremely well, which helps him jump in the play and contribute offensively, which is something Colorado could put to good use. Despite all of this, scouts have noted that Cohen needs a little more work in his own end. One player who has the potential to be a top-four defenseman in the NHL is Stefan Elliot. He has a lot of offensive talent and recorded 16 goals and 39 assists while playing for the Saskatoon Blades of the WHL last season. If Elliot lacks in anything it’s being able to move opposing players from the front of the net, but I believe he bulked up during the off-season. So there you have it, folks. Three defenseman that I believe could make the team if they have a good camp. Do you agree or disagree with my three choices? Do you think a forward might make it out of camp? Let me know by posting a comment below!